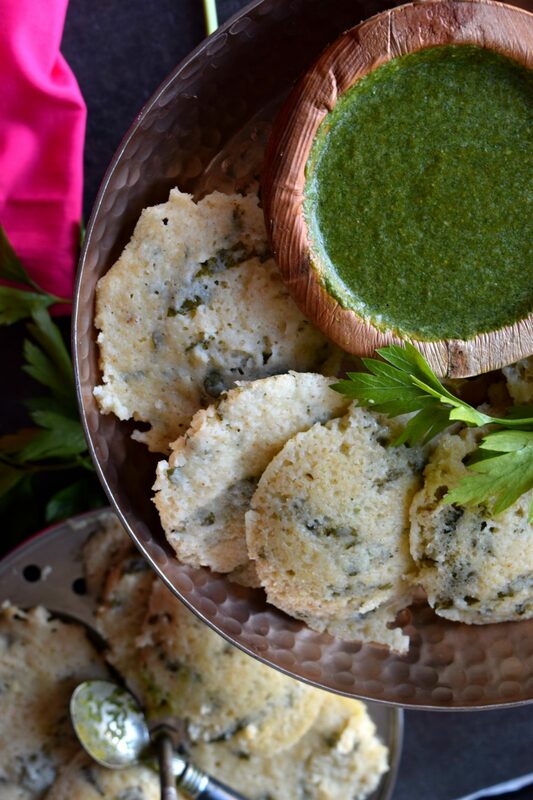 Oil Free Bulgur Wheat Spinach Idli is an extremely nutritious and delicious South Indian breakfast recipe. No fermentation is required and can be made instantly. South Indians and food go hand in hand. There is an ongoing joke in our community that we do not have blood in our veins but sambhar and rasam instead. We are passionate about the food we make and cannot do without certain food items no matter which part of the world we are in. I think this emotion is true to every community and its cuisine. We all love and crave the food we have grown up on. We associate food strongly with certain memories and that is what makes the dish extra special. Certain foods remind us of the warmth of our mom’s hands while feeding us or sometimes even just an aroma rekindles a memory of your grandma’s cooking. Such is the power of food. to prepare it. It’s easily digestible and soft to chew, hence given to toddlers and old people as well. 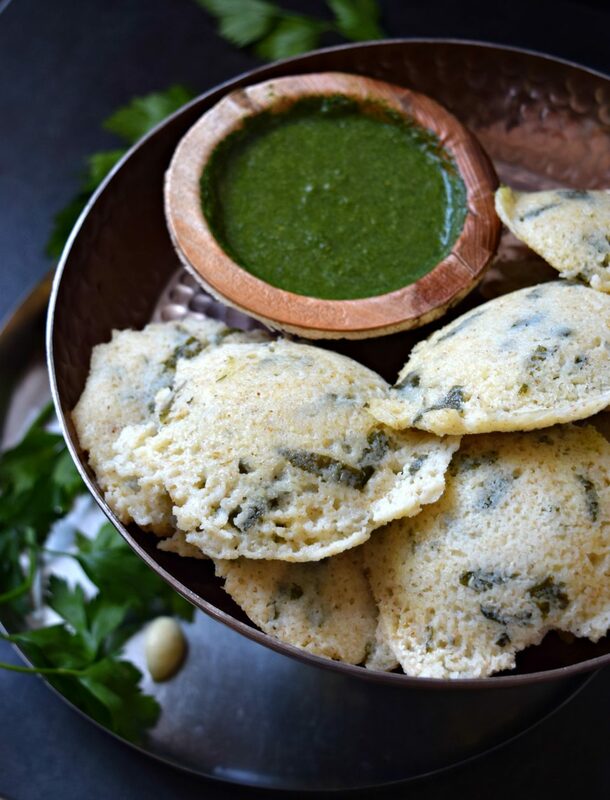 Although traditionally the batter needs to be fermented, there have been many instant idli recipes that have been created over the years for people who cannot wait. 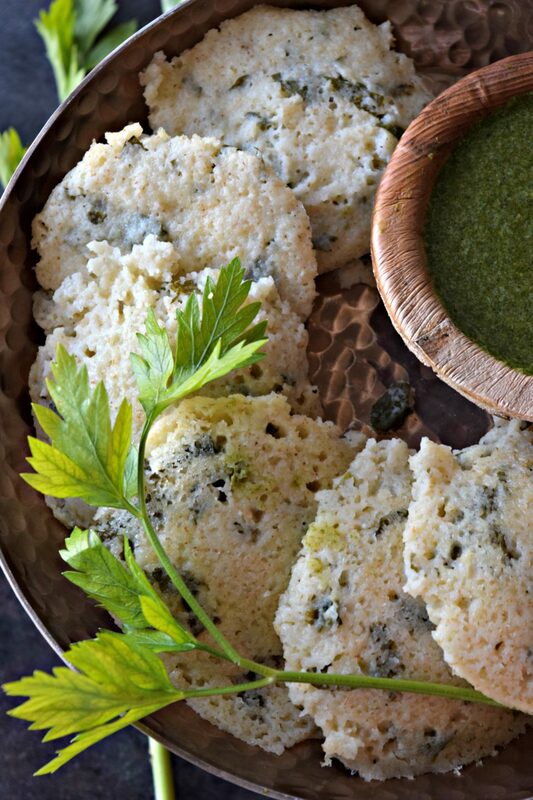 My grandma would make the softest idli and it was she who also introduced us to instant idli. We preferred that option because that ways, we would get to eat it at that very moment. Patience was truly not a virtue in us back then! 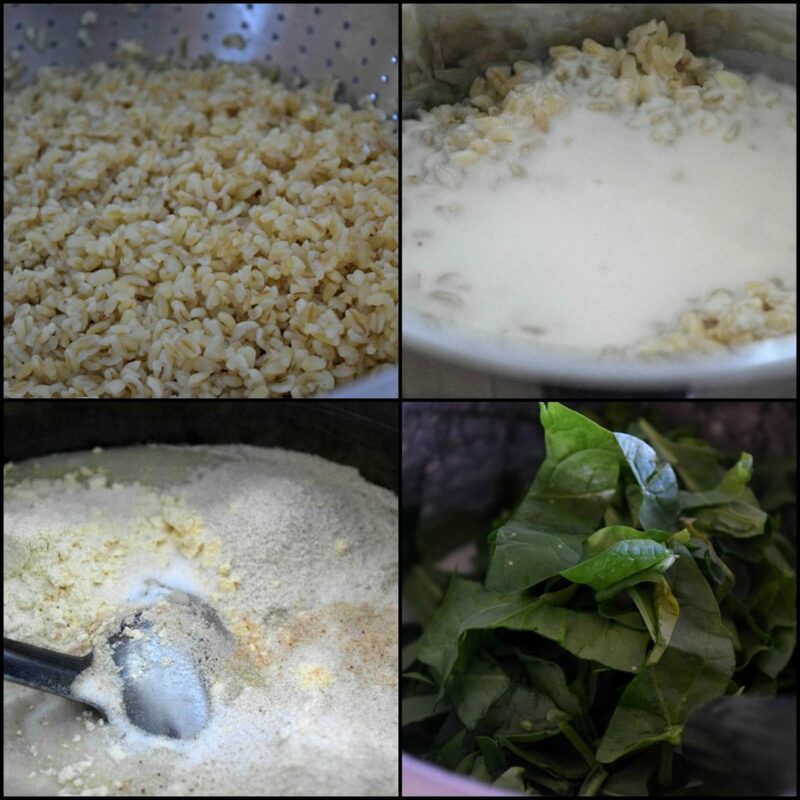 Today as a food blogger, I was trying a new ingredient – Bulgur wheat and I was anxious. I had no reference and all I knew was that I had a power ingredient in hand and it wold take me further. but that didn’t work either. I was getting dejected and even made a call to KR to crib about it. He calmed me down and coaxed me to try something else with the batter. That is when I started to think about making idlis with it. Therefore, you can say that this recipe was created by accident, however the taste goes to prove that if you have the right ingredients, the dish will not fail you. , chopped spinach, chopped cilantro and salt. Mix them together. Once done, let it cool down and then de-mold them with a spoon. 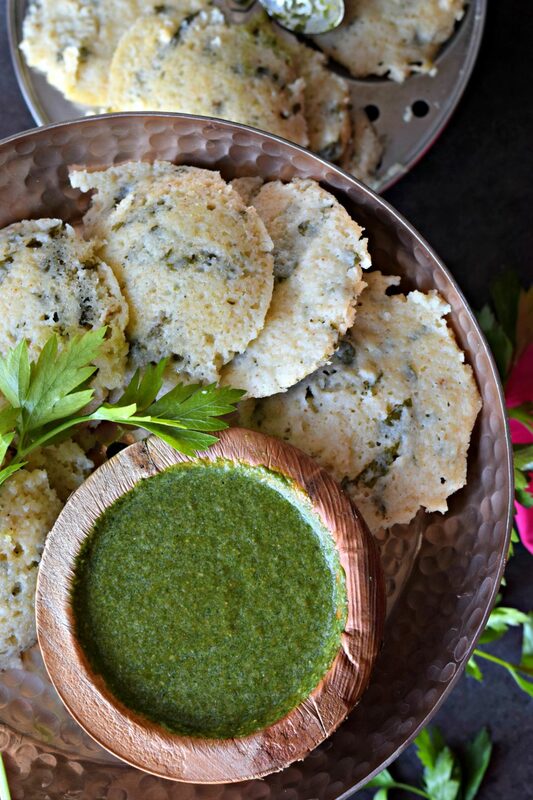 Serve them warm with any Green chutney/Coconut chutney/Sambhar or Mulagapudi. This recipe is for weight watchers, pregnant ladies, diabetic patients, children and anybody who loves nutritious food as it is rich in fiber and will ease digestive problems as well. Bulgur wheat proves to be a great breakfast option, as it provides an adequate amount of energy (calories) and protein. Since our body requires calcium, the addition of yogurt increases the calcium content in the recipe. This instant breakfast recipe is god sent for obvious reasons! Wash and soak bulgur wheat in hot water for 15 minutes. Drain the water and add it to a blender with yogurt. Blitz to a smooth paste. Pour this into a mixing bowl. Add whole wheat flour, chickpea flour/besan, baking soda, chopped green chillies, asafoetida, chopped spinach, chopped cilantro and salt. Mix them together. Dry roast semolina and add this to the batter. Mix and let it rest for 15 minutes to settle. Add more yogurt if required to get the desired batter consistency. 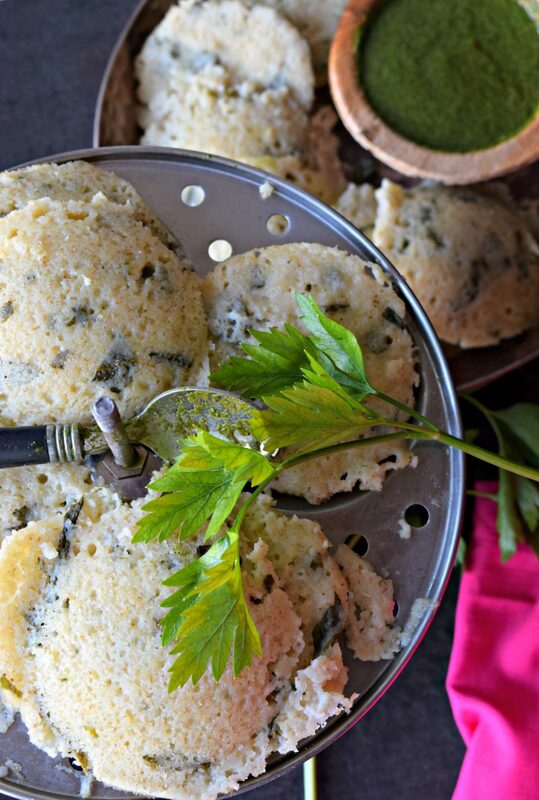 Grease idli molds with cooking spray (optional) and fill the molds with batter. Steam the idli as per the instructions of the idli cooker. Once done, let it cool down and then de-mold them. 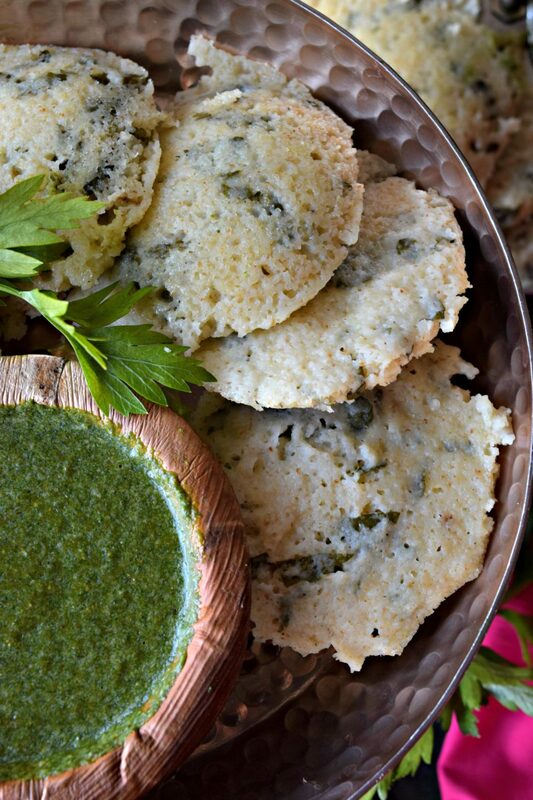 Serve them warm with any Green chutney/Coconut chutney/Sambhar or Mulagapudi. Add more veggies to the batter like carrots, green peas and cabbage if you like. Liked this recipe? 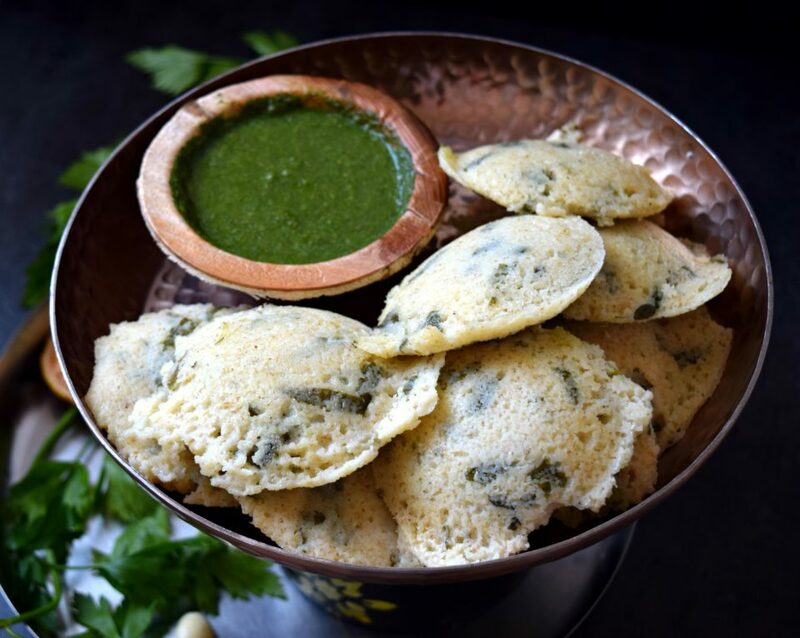 Then check out some more interesting Idli recipes here – Mini Masala Idli, Vermicelli Oats Idli, Oats and Flax Seed Idli and Healthy Vegetable Idlis in Pink. 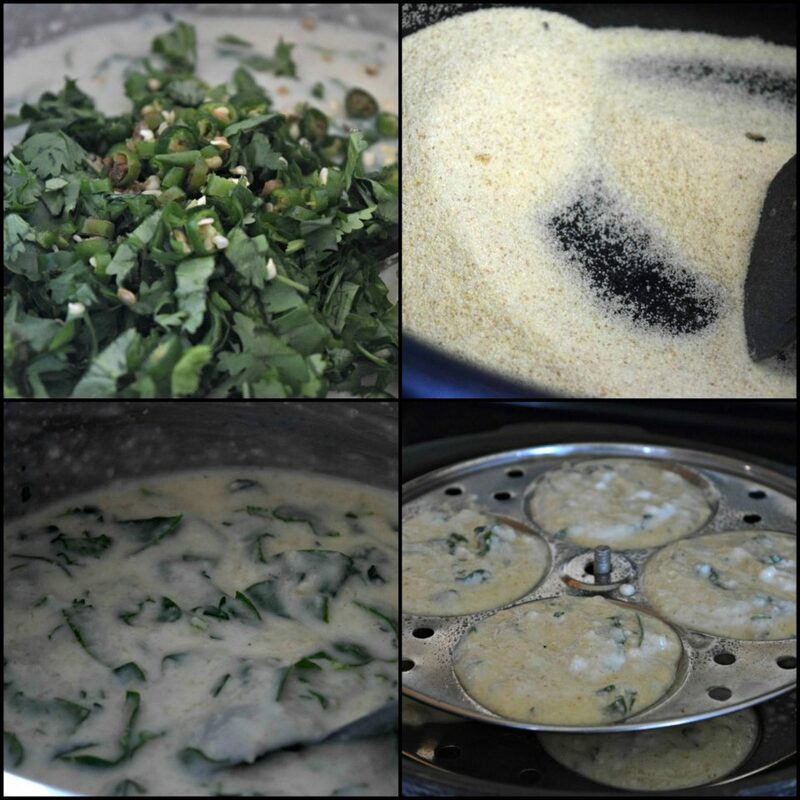 If you also want to check out some popular South Indian recipes then try Avial Mixed veggies cooked in curd & coconut gravy, Masala Dal Vada/Lentil Fritters, Paruppu Rasam, Traditional Curd Rice, Poricha Kootu (Vegetable and Lentils gravy) and Indian Coconut Rice.